Knowing the parts of your bicycle can help you in your conversations about it: is the seat uncomfortable because the seat post is too high or because the saddle itself doesn’t suit your needs? 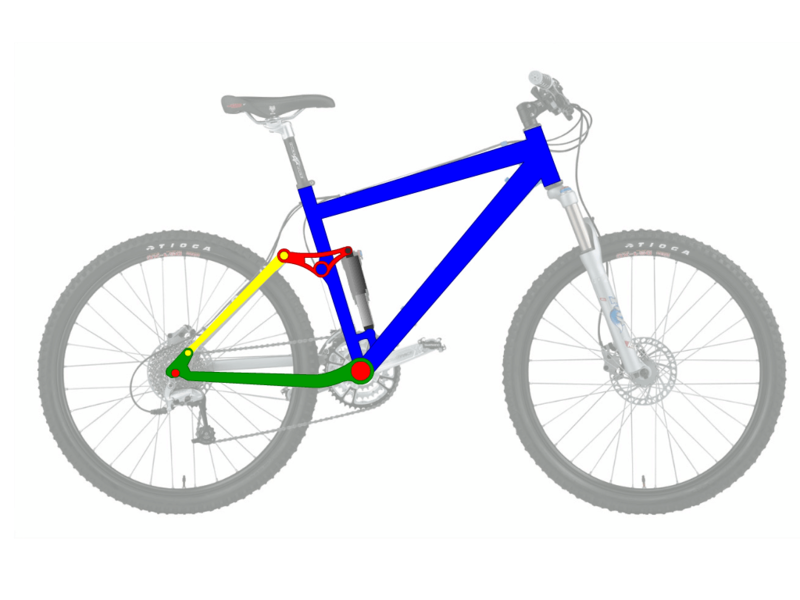 The diagram above shows the standard configuration for many comfort hybrid and light cross-country mountain bikes. Some bikes, though, have rigid forks. BMX, road, triathlon, and performance hybrids typically have rigid forks, as shown at left. A rigid fork provides better performance and makes it easier to go faster on smooth surfaces. A suspension fork absorbs bumps, keeping the wheels in closer contact with the ground at all times for better performance on rough terrain. The suspension also makes for a slightly plusher ride when on flat surfaces or when installed on a comfort bike, at the cost of some weight. Suspension seat posts are another common feature of comfort bikes. They add weight but provide a more cushioned ride over small bumps. They’re not desirable on mountain bikes because the seat on a mountain bike is part of controlling it. Adding suspension to a seatpost makes the seat harder to control the bike from. Four bar rear suspension, one of the common forms of rear suspension. Mountain bikes designed for freeride, downhill, or all mountain riding generally have rear suspension in addition to front suspension forks. They are sometimes referred to as dual suspension bikes. Rear suspension allows for more shock absorption. When riding over extremely rough terrain, dual suspension allows both wheels to stay in contact with the ground at all times, which means greater control for the rider. There are several different styles of rear suspension for different styles of riding. Come on in to see them in person! Drop bar handlebars, which are common on road bikes. Handlebars also come in several varieties depending on the style of riding. The most common is the one picture at top, the flat bar handlebar. Flat bars provide the greatest stability in steering, and are common on mountain bikes as well as hybrids. If you’re riding primarily in around obstacles like trees or traffic, they give you the best view. Drop bars are common on road bikes, and provide versatility at light weight. They’re a great midpoint between aerodynamics and control. They give better control for navigating in the middle of a pack of riders and more stability than an aero bar. Additionally, drop bars offer multiple riding positions: on the drops, on the hoods (the black parts, on the image at right), and in rare circumstances on the flat sections. Aero bars attached to regular bars provide more riding positions, oriented for speed. Aero bars usually attach at the centre of the handlebars. Though not all handlebars will work: if your handlebars are not one of the types mentioned here and you’re interested in aero bars, bring the bicycle in and ask! Aero bars provide an extra riding position that is aerodynamic and designed for both comfort and speed on long flat sections of road. The aero position also offers relief for wrists on long rides, since the rider supports themselves on the bones of their arms, not using the muscles in the wrist. It offers less ease of manoeuvreability and visibility in traffic, but that’s why they attach to other handlebars. Different riding positions provide a variety of benefits, depending on the kind of riding you want to do. The style of bike is strongly related to the riding position. The bike at the top is fairly upright, designed to balance between the ease of speed that comes with being in a more aggressive (forward-leaning) posture and the comfort and better viewing position of a more upright position. More upright are usually comfort hybrids, comfort bikes, and cruisers. They provide a comfortable, upright ride, but are less designed for efficiency: you’ll work hard to go fast. More upright bikes are ideal for relaxed riding on a sunny afternoon when you want to admire the view. On the other end of the spectrum, triathlon and road bikes have a very aggressive posture for the most ease of speed.